I haven’t shared a recipe for a while and last night I cooked a vegan version of macaroni and cheese which my kids love and so do we. It’s adapted from a recipe called Sunflower Mac in one of the best vegan cookbooks on the market, Isa Does It. My sister told me recently that the photos I put on my blog to accompany recipes often look like vomit. This is the nice thing about sisters: they tell you the truth when others are too polite to say it 🙂 I’m still going to include a photo with this recipe but it’s not very good and possibly looks more like vomit than food. This is partly because I forgot to take a photo and we’d all licked our bowls clean before I realised. So I had to scrape the remains from the saucepan and put them in a little ramekin. This is all there was left. Is a bad photo better than no photo? I don’t cook with salt but feel free to add some salt to taste. Fry the onions and carrots for about 10 minutes until soft then add the garlic and fry for about 30 seconds. Cook the pasta while the onions and carrots are frying. Remove the onion mixture from the heat and add the vegetable stock, tomato paste, ground cashews, and lemon juice. Use a stick mixer to mix it all up into a smooth paste. Add the flour and return it to the heat for a few minutes to thicken the sauce. When the pasta is done, pour the sauce over the top and mix well. Serve and eat! The original version of this recipe users sunflower seeds instead of cashew nuts for people who are allergic to nuts. 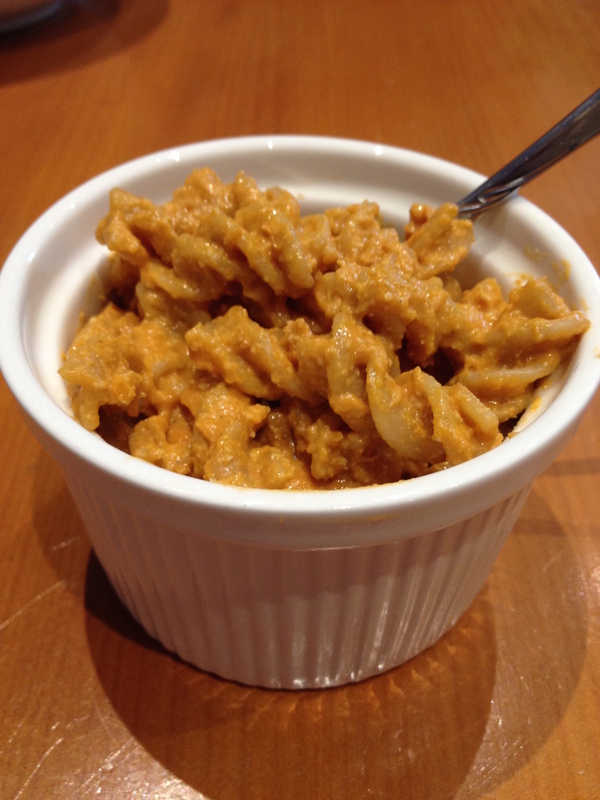 Posted in Recipe and tagged macaroni cheese, pasta, recipe, recipes, Vegan, vegetarian. Bookmark the permalink. I’ve made a version with pumpkin seeds, which I think I prefer to the sunflower version. I haven’t tried it with cashews yet. Pumpkin seeds sound good. I’ve never tried it with sunflower seeds because I’m rather partial to nuts and cashews in particular. But I’m keen to see what it tastes like so might try it one day. That looks delicious. How did it taste? Anything like the ‘real’ cheese version? I’ve been wondering what vegan cheese tastes like and have thought of adding it to my diet. It is really delicious. I think it’s nicer than the real cheese version but I might be biased. I’m also very fond of cashews. And you are so right about carrots! When I first saw the pic, I thought it was a stylish new way of displaying your food! On an unrelated note, I had my first mild indignation with the Co-wheels car tonight when some random member of the public parked in its space! Luckily I was able to get a space nearby. The Co-wheels customer service team was very good as well. Oh no! That hasn’t happened to me yet: the parking spaces are always available. What a pain! Glad there was another spot nearby. Have you used any of the electric cars yet? Ha ha, as I read your message, I was just getting ready to go out on my first electric trip! I’d chosen a late night booking so that there would be less traffic on the road. It still took me 15 minutes to start it – I still had difficulty remembering to co-ordinate putting my foot on the brake but mainly I wasn’t aware of how hard you have to press the accelerator to make it go, and it was weird not having the feedback of noise. Also had trouble braking – kept pressing too hard. So first 15 minutes were slightly terrifying. However, my friends were really impressed with it when I gave them a lift! Professional food photographers often shoot photos of food nearly raw; you’d likely get sick if you ate anything that looked good in a photo.